LiPo batteries (short for Lithium Polymer) are a type of rechargeable battery that has taken the hobby world by storm. LiPos have three main things going for them that make them a perfect power source for your AEG, over NiCd or NiMH batteries. • They are lightweight and can be made in just about any shape and size. • They have large charge capacities; capable of holding much more energy than the same size NiCd or NiMH batteries. • They have high discharge rates with the capability to supply more power to even the most demanding AEG. 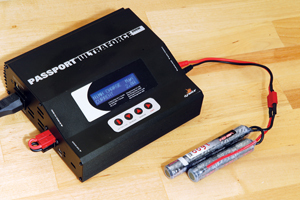 There are some common myths regarding LiPo batteries that I want to address in this article. The first, and probably the most common myth is that LiPo batteries are very dangerous to use and can easily explode. This is not really a myth, as improper care and feeding of these batteries can, indeed, cause them to explode. While the same thing can hold true with NiCd and NiMH batteries, we have all seen the drama unfold on YouTube videos where a LiPo pack unleashes a ball of fire while spewing shrapnel upon failure. While these videos are always cool to watch, they do instill fear in many people who are thinking about making the switch, especially when the batteries are to be installed in a weapon that is held close to your body. Fear not! The key to avoiding your own personal fireworks show is to invest in a good charger, understand the charge and discharge capacities of your battery and always visually inspect the packs before using, charging or storing. LiPo batteries have three main ratings to tell you what the battery capacity is; number of cells (i.e. voltage), C-rating and current capacity. You will commonly hear a LiPo battery being referred to as two, three, four or more “cell” pack. They can also be noted as certain number “S” battery, i.e. “2S” or “3S”. Each LiPo cell has a nominal voltage of 3.7. So a typical two-cell or 2S battery will have a voltage of 7.4 and a three-cell or 3S pack will have a voltage of 11.1. If you are used to using a typical NiMH or NiCd 8.4 volt battery, then you need to determine if you should use a 2S or 3S as a LiPo replacement. In theory, a 2S (or 7.4V) LiPo should produce a slightly lower rate of fire whereas a 3S (or 11.1V) pack should demonstrate a higher rate of fire than the 8.4V battery. However, since LiPo batteries have a lower internal resistance and have the ability to unload current more rapidly, in many cases you will not see a performance loss when moving from an 8.4V NiCd to a 2S (or 7.4V) LiPo battery; in fact you might see a performance improvement. However, moving to a 3S (or 11.1V) LiPo will most likely give you a higher rate of fire. Because of this, I always suggest you verify that your gun’s mechanics are adequate to handle the increased load. In my experience, most are, especially since you are not increasing the voltage by that much, but if your AEG is pushing the limits with an 8.4V battery, then I would not move to a 3S LiPo. C Rating x Battery Capacity (in amp hours- Ah) = The Discharge Rate in Amps. If we have a 2S 7.4V 2700mAh 30C LiPo battery, we can use the above formula to learn that this battery has an 81A rating (30C x 2.7Ah = 81A). This is not a number to freak out about as it is simply telling you the capacity. It does not mean that once you connect it to your gun you are forcing 81A of current through it. To compare, let’s look at a typical 8.4V 1600mAh NiMH battery that might come with an AEG. Most NiMH cells have a “C” rating of up to 12C. Again, using the formula above, we can determine that this NiMH battery is capable of discharging 19.2A continuously. When you consider that the physical size and weight of both batteries mentioned are going to be very close, you can see that the LiPo can give you much more bang for your buck (pun intended). Let’s taking a look at my MK46 which requires about 23A to drive the gearbox. This particular gun houses the mini NiMH battery that I mention above. The problem is that the gun requires 23A but the battery only has a capability of producing 19.2A, which leaves the gun underpowered by close to 20%. To improve this, I can step up the battery to a 9.6V NiMH, provided there is room for the extra cell. However, in this case there is not. So my only alternative is to look for a battery that has more capacity for the same given size. Enter the LiPo! Since the AEG requires 23A of current to run at its full potential, it will only draw a maximum of 23A as it cannot and will not use more current than it needs. However, it will try to pull as much as it needs. So with the stock battery, the motor and battery are overtaxed because it is trying to draw 23A out of something that cannot possibly supply it. Using the LiPo battery, I have 81A of available current and the MK46 will only be using about 30% of its capability, allowing the gun to operate at its full potential while not overtaxing the system in any way. Also notice that we are only using a 7.4V (2S) battery to operate the gun. As you can see from the example above, the myth that your gun needs to be heavily upgraded to handle a LiPo battery is simply untrue, as it is only going to use the maximum amount of current required to operate at 100%. In fact, there is an increased strain on your motor when you are forcing it to operate at its would-be full potential but you are not giving it the current required to do the job. Where this myth can possibly hold true is if your AEG internals are maxed out with an 8.4V battery and you decide to replace it with an 11.1V (3S) LiPo. This increased voltage will cause the motor to spin faster and if your internals are not up for the increased strain, you can end up damaging it. This really has nothing to do with a LiPo battery though, as the same damage can occur if you put a higher voltage NiMH battery in as well. The third myth about LiPo batteries is that they require a lot of special attention and you need to handle them with kid gloves. First, a LiPo battery is not a baby and it’s not made of glass! You are not going to break if you handle it in the same manner as a NiMH or NiCd pack. While LiPo batteries do require a little more attention to maximize their output and use, you will find that the long term benefits vastly outweigh any extra “attention” you need to give them. The first thing that I always recommend with any LiPo battery, even if brand new out of the package, is to inspect it. When a LiPo cell starts to go bad it will tend to puff up a little. Don’t think that if it is brand new that it should be ok, because I have seen LiPos that were going bad right out of the box. If your battery pack has a rounded or puffy look to it, then don’t use it. Send it back to the manufacturer to have them inspect it. Additionally, and this holds true for any battery chemistry, be careful not to puncture it, short out the wires, set them on fire or drop them. This is one area where I tend to overemphasize investing in a good charger. Yes, you can get by with a simple wall charger, but many times these chargers can take up to two hours to fully charge a LiPo and they usually do not have any protection circuitry built-in to monitor your battery. 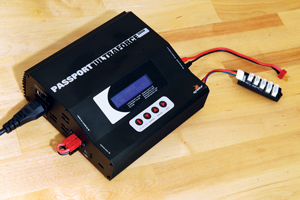 A higher end charger, like the Dynamite Passport UltraForce, has the ability to fast charge a LiPo safely, polarity check and store multiple battery profiles in memory. The UltraForce charger comes with Tamiya, Deans and EC3 connectors as well as an integrated balance circuit. It has the capability to charge many types of battery chemistries in addition to LiPos, such as NiMH and NiCd packs. The balancing circuit is the key feature on any higher-end charger. This circuit uses the smaller, multi-wire connector to monitor the status of each cell independently from the pack as a whole. It makes sure that each cell is charged to the same level. Operation is simple, just plug in the battery and the charger does the rest. Let’s talk about charge current for a second. In the same way there is a “C” rating for the discharge capacity, there is also a recommended “C” rating for charging the LiPo. As an example, if a LiPo pack has a capacity of 2000mAh and it has a charge “C” rating of 5C, that technically means that the battery can handle an input current of 10A (5C x 2Ah). I personally like to err on the side of caution and never charge any of my LiPo batteries at more than 2C. Just because the label says you can, does not mean it is the best practice, and charging a LiPo at its max “C” rating can lower the lifespan of the pack. Charge “C” rating is also a handy way to indicate estimated charge time. For example, a 1C charge rate would indicate that you charge the battery at its rated capacity. With the battery above, if I was to charge it at 1C, or 2Ah (2000mAh), I can estimate a charge time of one hour. I am charging it at two amp hours, or two amps per hour. If I increase the charge rate to 2C, or 4Ah (4000mAh) then I can estimate a maximum charge time of 30 minutes. I know a lot of people that are impatient and will crank the charger to the max charge rate. I personally prefer to have more than one pack on hand so I can charge them at a safer rate and still enjoy the hobby with no downtime. I also strongly suggest investing in a LiPo sack for charging. This is just a precaution because if your LiPo is damaged and you are unaware of it and trying to charge it, there is a chance it could ignite. Because a LiPo ignites so violently, these charge sacks will contain the fire while venting out the excessive gas without risk to items or people around it. LiPo batteries do not like to be discharged below 3V per cell. Doing so excessively will damage the battery. While I understand that you are not going to have a voltmeter on during the heat of battle, my best advice is to stop using the battery as soon as you feel its performance decrease. A LiPo will maintain pretty steady performance and then drop off suddenly as the pack depletes, so as soon as you feel the rate of fire decrease, stop and charge or swap the battery out with a fresh pack. Storing a LiPo battery is pretty much the same as any other battery. However, most higher-end chargers will have a feature to charge your LiPo for storage. It will balance the cells and leave the pack at a safe voltage. If you discharge your battery and then leave it for a long period of time, there is a chance it will not recharge to its full capacity, so the storage feature on the charger is invaluable. I also suggest leaving LiPo batteries in a metal ammo tin or in separate LiPo sacks if you intend to leave them unattended for a long period of time. There is always the fear that if one pack goes up, it will take the rest with it, so this little precaution will allow you to sleep better at night. 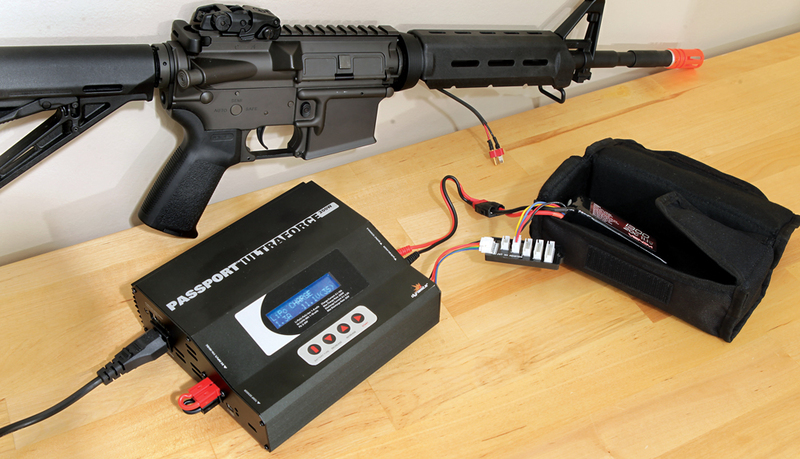 Now that you know what you can expect in terms of increased performance by switching to a LiPo battery, your next task is to find one that will physically fit your gun. There are a lot of options out there and since LiPos are becoming more commonplace, you will see many manufacturers in the future providing LiPos in all shapes and sizes for a variety of AEG applications. Just remember to read the label and invest in a charger that will safely monitor and balance your LiPo while charging. Previous Tactics – Shoot, Move, Communicate!